Cleaning a rug properly enhances its appearance, age and value. 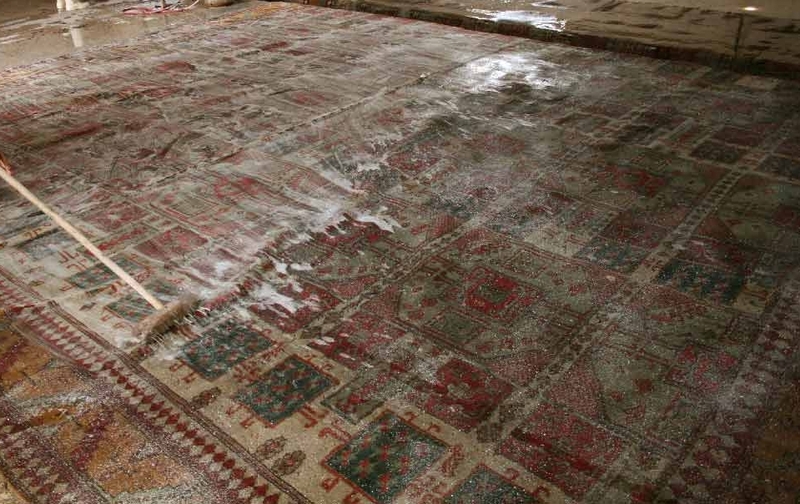 We employ special and professional methods to clean your valuable rugs. Do not try to wash and clean them by yourself or allow ordinary carpet cleaners to clean your fine area rugs. Regular carpet cleaners and dry cleaners usually use one or two standard methods of carpet cleaning and use detergents and chemical washes that can be damaging for handmade rugs and some other types of rugs. Cleaning methods required for cleaning area rugs differ according to the type of rug being cleaned. For instance, antique rugs must be cleaned gently and hand washed using milder soaps and detergents, without the use of heavy brushes etc. We specialize in Oriental rug cleaning, wool rug cleaning, silk rug cleaning, handmade rug cleaning, and antique rug cleaning. The first stage of the professional cleaning process is to thoroughly inspect your area rug. Doing so allows us to decipher valuable information about your particular rug. Things we determine include whether a rug is machine made or handmade, where it was made, a rug’s age and its fiber content. Determining these factors – and more – is important in determining what method and what materials are suitable for use in washing your particular area rug. Pre-existing conditions such as tea-washing, tears, old spotting attempts, sun-fade, residue from past cleanings, stains, and other damages are also revealed to us when we inspect your rug. Overall, the laborious process of thoroughly and meticulously inspecting your rug enables us to ensure that we care for your rug to the best of our ability so that when we return your rug to you, you are completely satisfied. Prior to washing your rug, it must be dusted in order to remove any extra particles, dust mites and other objects that may have built up in your rug over time. In the dusting stage of the professional cleaning process, particulate matter is removed from the rug so as to prepare it for washing. Simply vacuuming an area rug cannot completely remove all the unwanted matter that has collected over time in the rug, even if a rug is vacuumed from its front and back sides. Professionally dusting your rug removes most, if not all, unwanted materials. Dusting helps eliminate those particulates from your rug which cannot be taken out by vacuuming. The next stage of the professional cleaning process is to wash your rug. In this stage, your rug is meticulously washed by hand with flowing water. This allows us to ensure that your rug is thoroughly cleaned. During the washing stage, we try to make sure that the cleaning agents we use are either completely chemical-free, or else contain minimal chemicals. Typically, the shampoo used by us in washing your rug is a neutral pH-balanced solution. Depending on the type and state of the rug, it may also need to be conditioned in certain instances. Lastly, once it is washed, your area rug needs to be dried. In this stage, steps are enacted to ensure that all water, moisture or dampness is completely removed from your rug. The drying process is done by hand; no wringers or rollers are employed. We also strive to ensure that no electronic dryers are used in this process. Once as much water as possible, has been removed, your area rug is hung to dry naturally in a climate controlled room. This usually takes 24 to 48 hours until an area rug is completely free of any residual moisture or dampness. Once we have ensured that your rug is completely dry, we use a purpose built brush that combs your rug and fluffs the pile to achieve a texture that leaves your rug looking and feeling as close to new as possible. As a courtesy to our clients, after your area rug is thoroughly and meticulously washed and completely dried, we use yet another purpose built brush to comb your fringes. This leaves the fringes, even on the oldest of rugs, looking more orderly and even. At Amara Rugs, we strive to provide you with superior rug care and the finest results. Our attention to detail, meticulous care and professionalism, all become evident in every step of our interactions with our customers and in the results we achieve. If you would like to get a quote or schedule an appointment please fill out our Contact Us form.